After the layout of your UNIQUE swimming pool, excavation is the next step. 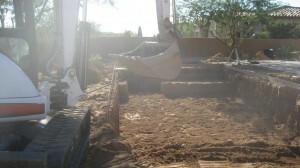 This phase of the project actually marks the beginning of pool construction. Also, our first progress payment is due at this time. This allows us to get all the materials and pool equipment for your project. This step makes probably the BIGGEST impact in the entire project as you transition from seeing a flat drawing of your pool on the ground to seeing an actual three dimensional version of the pool. It also causes the most damage to surrounding landscaping, underground lines and patios so be ready for what could appear to be very messy. 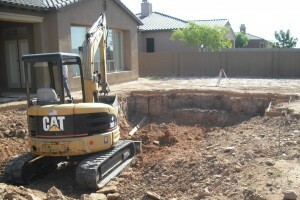 “EXCAVATION” – BRIEF OVERVIEW: After the pool is laid out, it is ready for excavation. The layout serves as a precise marker for the excavation crew who will come in and start to dig your new pool. These guys bring the heavy equipment in, and make digging 7′ deep look like a very simple process, unless we hit rock. As experienced as our excavation team is, this is NOT a finesse job. They will most likely run over plants, pavers, and anything else left in the way in order to get the job done efficiently. This is 100% normal, but they will have some respect for things OUTSIDE of the construction area. The excavation of the pool can take as little as one day or up to 5 days, depending on the size of the pool, the soil conditions, the complexity of the design and scope of work. As a landscape and general contractor as well as a pool contractor, don’t be surprised to see our excavating crew starting work on your landscape project as well. It is not uncommon for them to help by digging tree holes, footings, and other parts of the job to help keep our entire process on schedule and operating efficiently. It can be a mess, but during any construction project, it gets worse before it gets better. I’ve spent lots of time & effort in caring for my existing landscaping, plants, and irrigation – Is there anything I can do to protect these during pool construction? Think of it this way, we have a huge & complicated pool to build for you, and although we really would like to do it with little to no additional damage, this is virtually impossible. We’ve come to expect SOME damage in all areas in & around the pool (probably 5′ to 10′ outside the pool). Our theory – pool construction can range from $20K & up, so we are focused on doing that correctly instead of who stepped on the plant. Now, with that being said, all of our subs & employees should treat your project as their own – but, anything that you want to keep out of harms way, please keep out of the construction zone (put inside the house, garage, or on the side yard). They left a huge section of my fence down, can that be put up immediately? Access on a pool project is critical. The access point is usually left for about 3 weeks (after decking) before it is put back up. There should be some protective netting (or temporary barrier) there to protect others from your yard, but this is not meant to keep in pets – sorry, keep them kenneled! I’ve got an irrigation leak that the excavation guys caused, will you fix it? This is a common issue in pool excavation – it’s a frequent issue that always pops up – WE HIT AN IRRIGATION LINE! You’d think as landscape contractors too that we’d have this covered, but there is no landscape crew or irrigation technician scheduled on your project for weeks. We will obviously shut of the water for a mainline leak, but you may notice a leak coming from a drip line that runs for a brief time daily. Please turn off the irrigation timer, or plug this leak if you see it. If you can’t figure it out, we’d be happy to send someone by to help you out – just let us know. Unless otherwise stated in our pool construction or landscape agreement, the homeowner will be responsible for any repairs.